0 Members and 1 Guest are viewing this topic. Read 4498 times. Lets look at the Bass driver amps etc. which will be run independently of the mid and tweeter. I am taking a separate output from the speaker terminals of my power amp. It's difficult to get a real fix on the voltages involved but Googling reveals between 20 and 40 volts. This will need to be knocked back to 2 volts which is typical of line level. As a reality check, it seems that most sub manufacturers build this into their kit, hence allowing a high level input in addition to the line level input. A forum friend has purchased for me a unit like this. If this works OK by feeding the resultant signal to a Rotel integrated amp then I am good to go on ordering the MiniDSP to set up a low pass filter. Long term there may be higher quality speaker to line level converters that I can get, but for now its a step forwards. My matching super tweeters are now in place. The mounting is intended to get the voice coils of all drivers close and in the same vocal plane. Initially they are upward firing and a variety of caps are available to set the high pass frequency. Let the experiments begin. With a 0.47uF capacitor they have slipped into the OBs perfectly. Their presence can’t be detected, but there is an additional ‘air’ to the presentation which I like a lot. I suspect as they run in, there may be further gains. 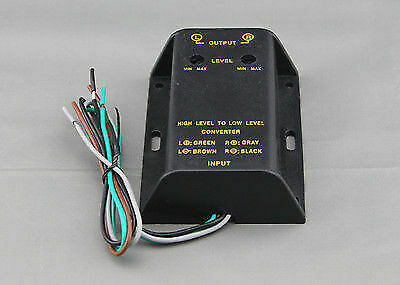 I am now looking to improve the 4" high frequency drivers. If the weight of drivers correlates to the weigh of the Alnico magnets there is an interesting comparison. Wow, looks a great driver large magnet, how is the sound from this driver? Just got them and at present I have only checked that they are working OK. Certainly sound more alive than the Grundigs they will replace. They don’t have screw holes, so I need to find a way to mount them. The pressure ring dont came with the driver? The magnet cover cant be put near metal. No there isn’t a pressure ring, but the drivers are probably 65 years old so they went missing along the way. My drivers are recessed into the baffle from the rear so may hold them in place with a rubber strap stretched across the magnet and fixed into the rear of the baffle either side of the driver. Wood or alu rings are the material less prone to disturb the magnet. Good suggestion. I am currently thinking something like this. https://allensportsusa.com/products/4-rubber-straps. This will also add some damping. How these belts could be implemented? I will post a picture when I experiment later. Here's a picture of a cobbled together prototype. Hm, there is any photo from the face cone side? There is any space for metal clamps? No room for metal clamps in my baffle, but this system will work out ideal. From the front one would never know.